Scattered throughout the auditorium of The Cardinal Gibbons School, Baltimore, students from Mount de Sales Academy, Catonsville; Institute of Notre Dame, Baltimore; The Seton Keough High School; Cardinal Gibbons; and Mount St. Joseph High School, Irvington, practiced their lines, dance moves and songs. When dressed in costume, no one could tell which student was from which school and that’s the way the Five Corners Theatre Group likes it. 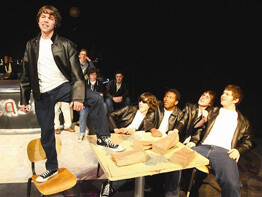 On Feb. 15 -18 the stage at Cardinal Gibbons will light up and the sounds of familiar songs like, “You’re the One that I Want,” Hopelessly Devoted” and “We’ll Always be Together,” will ring in the audience’s ears as they watch “Grease” come alive. “This is most of the group’s last show, and we want to go out with a bang,” said Brooke Wheeler, a sophomore at Seton Keough and costume designer for the show. According to Maura Hogan, a junior at Mount de Sales, this is the first musical the Five Corners Theatre Group has done, even though many of them have been in other productions at other schools. In the fall the group performed “Barefoot in the Park,” and it went so well they thought they would try a musical in the spring, said Maura, who plays Marty Maraschino, one of the Pink Ladies. This student-run group, with the exception of director Tony Cimino and music director Mandee Ferrier, came up with the name Five Corners Theatre Group to represent each of the five schools involved in the productions. For Ashley Thomas, a senior at Institute of Notre Dame who plays the role of Frenchy, “Grease” is her first show with this group. It took her a while to gain chemistry with her fellow actors, but in the end everything worked out, she said while smiling those around her. Erin Boots, a sophomore at Seton Keough, said she didn’t know many people when practice first started, but now she’s friends with everyone. “No one cares what grade you are in or what school you come from just that you’re in theater,” said Erin, who plays Cha Cha DiGregorio. William Foy, a sophomore athlete at Cardinal Gibbons, said the show brings out the students’ hidden talents. Danny Hughes, a senior at Gibbons who plays the role of Sonny, said the group has worked very well together even though they have had their share of drama. There is “something about being on stage that allows you to get to know each other,” he said. Everyone agreed that they have put their all into this show and they feel like a family up on that stage.